My husband and I are of Puerto Rican heritage (but we live in the mainland US), and one of our favorite meals are Empanadas. Empanadas are made with empanada wrappers (we buy ours frozen at the grocery), which comes in circles. The filling includes ground hamburger, chopped green olives, and a latin seasoning called Recaito. Recaito is a green paste/sauce made from finely chopped cilantro, green pepper, onions, and garlic. My mother-in-law makes her own, which is out of this world, but we often buy it in a jar at the grocery. Latin foods are very common in the US, and can be found at most grocery stores. One browns the ground beef, then draining the oil, adds the chopped green olives and recaito. It is all stirred together and cooked for about 10 minutes. Then you let it cool. After cooling, you spoon a 1/4 cup or so onto half of your empanada wrapper. You dampen the edges, fold the wrapper over, and smash the edges together with the tines of a fork to hold everything together. We then freeze them. To cook, I take a few out of the freezer (or you could just use the fresh-made ones), and put them in a heavy pan which has vegetable oil heating in it. The oil should be deep enough for the empanada to float. Fry them until they are golden brown, let cool on paper towels. I love them with a dipping sauce made from apricot jam and sriracha (a Thai pepper sauce). I hope you enjoy our empanadas! Hi Veg. I am writing about your blog for GettingSmart.com. I am very impressed! Would you mind if we posted one of your pictures? I will share my blog post with you once it appears. Thanks! Thnak you for asking. Yes it would be ok. Happy to share with GettingSmart.com. We also have 'empanadas' in Spain but I think that they are a bit different. It's so interesting to read how they are cooked in other parts of the world! I had never thought about freezing them (I know, silly hehe) but that sounds like a really good idea and I bet they are just as tasty. Also, the sauce made from apricot jam and the Thai pepper sauce sounds delicious. ummmmmm, we call this in Brazil Pastel. You can eat with cheese, ham, chicken and meet inside. Also have sweet ones with guava and cheesse, called Romeo and Juliet!!. I love this.. can not find here in Germany. Yeah, don't think You can find readymade empanadas here in Germany, but it shouldn't be that difficult to make those empanades Yourself.. I was just about to say that when I saw your comment. I've heard of Empanadas before but I would never guess they were what we call Pastel, here in Brazil! I love it. And my favorite pastel filling is cheese. yummy. 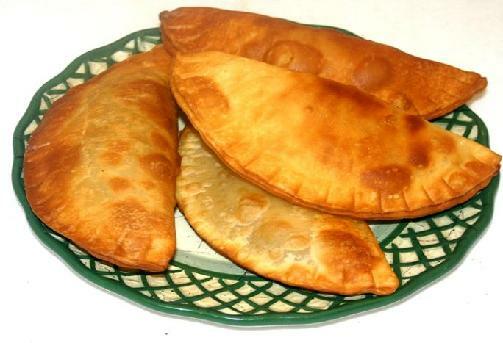 We have something called pasties here which look similar and have meat and vegetables (traditionally) inside. We don't tend to use heavy spices or peppers in ours though. Yours sound really good! With All respect, you say ground hamburger! Isn't that minced meat before it is made in to a hamburger and therefore nothing to do with a hamburger at all? OK, LOL, you got me. Hamburger or ground beef. In America we call raw ground beef, hamburger. It can be made into a Hamburger [beef patty sandwich] but it is often just chopped and cooked as crumbles for tacos, chili or lots of other stuff. Hamburger is the base for a many types of meals in the US because it is the least expensive kind of beef available. Some places it is called mince or minced meat. http://en.wikipedia.org/wiki/Ground_beef. So.. whaddya call minced / chopped pork meat in the US, then? 'Cause here in Germany many recipes ask for either minced beef OR minced pork OR a 50/50 mix of both.. It is so interesting to find out what foods are called in different places. It's interesting how latin foods vary from country to country--the "Romeo and Juliet" pastel sound delicious. Puerto Rico has a dish called "pastelas" that are made sort of like Mexican tamales. They are popular around Christmastime. I've made Empanadas in the heart of Shropshire! You can cook them in the oven if you want to be more health conscious, but fried tastes WAY nicer! !